Growing up, I had neighbors with a grape arbor in their back yard, and I tasted the grapes at every conceivable stage of their development, from the time they were just little green suggestions to the point where they were pendulous bulbs of heady delicious juice swaying in the August breeze. I remember the fresh tart flavor of the green grapes just as well as when they were ripe, with equal delight, which was why, the first time I tasted verjus, I was transported barefoot to one of those dew drenched summer mornings when Clare and I wandered back through the gate to take an early taste from the vines. When considering your seasonings, you might consider adding a bottle of verjus to your cooking rack. In just about every wine producing region in the world, vineyards are now producing their versions of it. Verjus is the juice of green grapes that are harvested and pressed before they are fully ripe. It has a nice tart flavor and can be used like vinegar or lemon juice in sauces and reductions, to add an element of clarity to your soups, in salad dressings or even stirred into a glass of iced water for a refreshing pick me up. Verjus was historically an important element in the production of mustard in Burgundy, so if you are cooking with mustard, you also might consider verjus to add a certain depth of flavor. It is not as acidic as vinegar or lemon juice, and tastes just like what it is, a mid-July grape. If you haven't cooked with verjus before, the first thing to do is acquaint yourself with the flavor. Open the bottle and familiarize yourself with it before even thinking about recipes. Put a spoonful in a glass of plain water and enjoy its tonic, astringent qualities while you think of uses for it. Note the way it feels going down, and any memories it might invoke. Anyone who as a child foraged berries and fruits knows this flavor. Historically, verjus was common in France up until in the 19th century, the phylloxera epidemic killed off the variety of grape that was used to produce it. Recently, a mustard producer in Beaune concerned with the authentic production of the historic sauces and condiments of Burgundy has re-introduced a variety of grape similar to the original for the purpose of producing verjus, and have returned the product to the market in this region. You can find it at the grocery store here in Lyon. For the expats or visitors looking for verjus in the shops: In Lyon, I have found verjus at the LeaderPrice on the presque’ile in the 2nd arrondissment, But like brown sugar or certain kinds of flour, it’s a kind of hit or miss thing. They run out of stock from time to time. You might go one day and find that any particular store no longer stocks it, which is why I always grab a bottle of verjus whenever I see it. 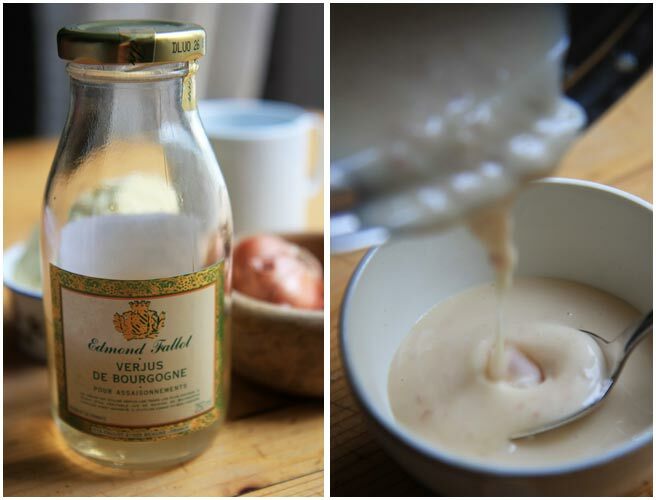 One nice use of verjus from my kitchen notebook is to prepare a shallot sauce a little bit like a beurre blanc, but using a combination of verjus and stock. In my kitchen notebook, this sauce finishes a lovely 3 flavor combination with smoked bacon and fish. Both the classic monkfish wrapped in smoked poitrine or something more sustainable like cod and crispy speck for example make a nice combination with it. Then again, if you've braised chicken for example and you would like a tangy buttery sauce to go with it, you can use the de-greased cooking juices from that too. Made with your house stock, this also goes very well with sausage - like a simmered Diot de Savoie. Melt 1/2 tablespoon of the butter in a saucepan. When it begins to sizzle, add the minced shallots and reduce the heat. Keep the shallots moving in the pan with a spatula, slowly sweating them without browning. After about 2 minutes, add the verjus, raise the heat enough for it to boil gently and reduce the liquid down to half, which should not take long. Add the stock or cooking juice, and let it cook down until the liquid is again reduced by half. Incorporate the remaining butter, little by little, whisking it into an emulsion. At this stage you can also use the hand blender to whip it into a smooth sauce or leave the shallots to add texture to your presentation. Season the sauce to taste with salt and drizzle it onto your fish or meat. Hi there! My name is Blair and I have recently been introduced to your blog, which I think is lovely and I look forward to reading more. Do you happen to know is Verjus is easy to comeby in the States? Hi Blair, if you live in a wine producing region, you might find it sold by a vineyard who has their own production, or you can get it online, for example through vendors on Amazon. Have fun! Ah, I'm going to keep my eye out for this. Thanks for the lesson - educational but also beautiful! Thank you, Sarah, that's very nice to say. I hope you come back and tell me what you have done with it when you do get some. We lived once in a great stone house with an allee of grapevines out the back door, and I loved the stroll of them, to be free to taste that bud of baby grape, and watch the swell of the fat roundness as they changed color in the ripening. I love to read the contemplative reflections that you write; the tastes and scents are so real in your words. And I believe, of all the writers I admire and read regularly, you are the one who REALLY stops to smell the flowers. I've always wanted to cook with verjus. My palate favors acidic and tart flavors, so I think I'd really like it. Haven't been able to find it around here, but maybe I should just splurge and order some online, thanks for the nudge! Lucy, it is wonderful to find you writing again on a regular basis! I love your topics, so interesting, and your words make a lovely story! Thanks for sharing all of this! I have never heard of verjus,it sounds very intriguing. Rachel, Noelle & Wendy - Thanks so much. Your encouragement means a great deal to me. Let me know what you do with the verjus! A few years back, there was an outbreak of verjuice in Australia which spread to the UK so that verjuice is not difficult to find here now. The dynamo for that outbreak was Maggie Beer who wrote a book entitled Cooking with Verjuice. But this was not the first outbreak of verjuice in the UK. In the Middle Ages, in Britain, a condiment made from unripe sharp apples or crab apples was used instead as apples were more widely available than grapes and crab apples were free. That's wonderful. May there be many more outbreaks of various food kinds the world over. I really love verjuice. It's becoming more popular here in Australia, too. I am never without a bottle of verjus in my pantry. I can't believe you find it at Leaderprice? I have never thoguth of looking there...I just always find it at Maison Lhote in Tours..I will definitely drop in at Leaderprice just Monday. As usual, your photos are so beautiful! I've read of Verjus in recipes and have been mesmerized by it, yet haven't seen it. I love your description of knowing the flavor, and so now I have to find out myself. Lovely. What a funny story, I chuckled, although I imagine how bad you must have felt. I'm Polish, and the same would happen there, it would be frowned upon if I decided to take my cup of coffee to the street. The traditions stay uncontested in the old country. We can love it or hate, it's just plain different. It's fun acquiring customs of a new country, isn't it? Although the liberal nature of North Americans is to be admired too. Loved the story. The Food Programme on BBC Radio 4 is broadcasting a programme about verjuice this coming weekend. After reading your post and The Food Programme's interesting broadcast on verjuice (thanks blowback) I bought some. I got it online. I first heard about this condiment some years back through reading Sudi Pigotts book 'How to be a Better Foodie' and was intrigued then. I got a white South African bottle which was nice but not what I was expecting. It is a lot softer and sweeter. And to be honest I dont think it warranted the £17 and change I paid for it (I'm including the ludicrous £7 something I paid for delivery). That being said it was just the right thing to go with the leeks I cooked last night. And I'm inspired to use it in place of lemon to make a lemon posit or even lemon tart. Oooh even a sorbet. The Food Programme waxed lyrical about how great it would be as a refreshing drink with soda water and crushed ice. Yes its nice but perhaps a cheaper and more accessible option would be grape juice and lemon. I am glad you were inspired to try it. The thing about verjus is that it's not this mysterious secret potion it has been cooked up to be, indeed it is a very basic ingredient. You're right. I sense a huge commercial revival around the corner though. I have tried several things I would never have done had I not read your blog; nettles and more recently your clementine confit. By the way what would you eat with the clementine's. They are particularly sweet but the skin provides a nice counterpart to the sweetness. Your photography is as enchanting as your writing. Your blog really is a work of art. It is wonderful to visit. Sadly, too many other blogs are becoming mere adverts (although I do appreciate the need to make money). Can't wait for the new sound man to arrive so we can hear more podcasts. We eat them plain, but if you slice one and serve it with chocolate cake it can't hurt. Thanks for your kind words about the blog. Pauline - as well as crab apples, I have also seen reference to it being made from pressed unripe sour apples so maybe juicing a few Granny Smiths, sharp cider apples (high acidity, low tannin) or cooking apples might work. Don't forget to heat to 72 degrees C or refrigerate the juice if you need to keep it for a while. Nice blog, Lucy! Thanks for transporting me to Lyon...I always wanted to visit...As for the Verjus, it makes a great substitute to vinegar when making a vinaigrette. We were one of the first producers in Germany of verjuice. I really don't know how I ever was able to cook without it :-). Find some recipes: http://www.weingut-fuchs.de/verjuice_recipes/recipes.php. There are also recipes available in Dutch and German.